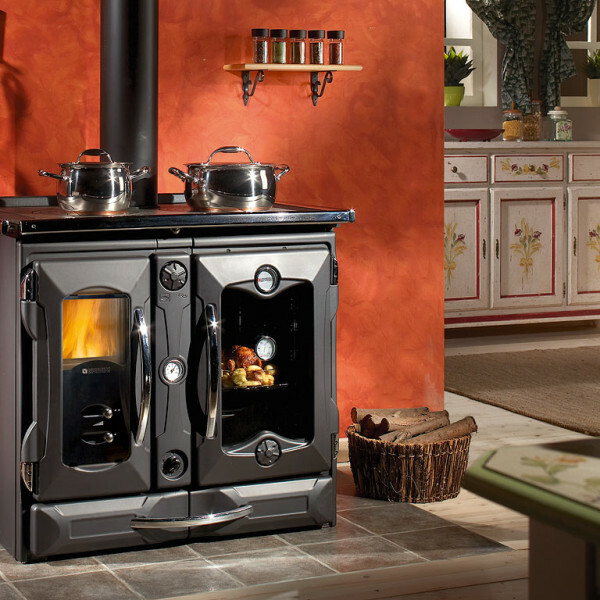 The Suprema Range Cooker from La Nordica is a full scale, solid and well-built wood burning cooker to rival the likes of an Aga and is well equipped with a large 80ltr oven. Featuring a completely cast iron hearth, a panoramic fire door with ceramic glass window to enable good views of the fire, an enamelled panoramic oven compartment and a superb choice of finishes such as anthracite black and matt cream, this cooker is an amazing all-rounder. 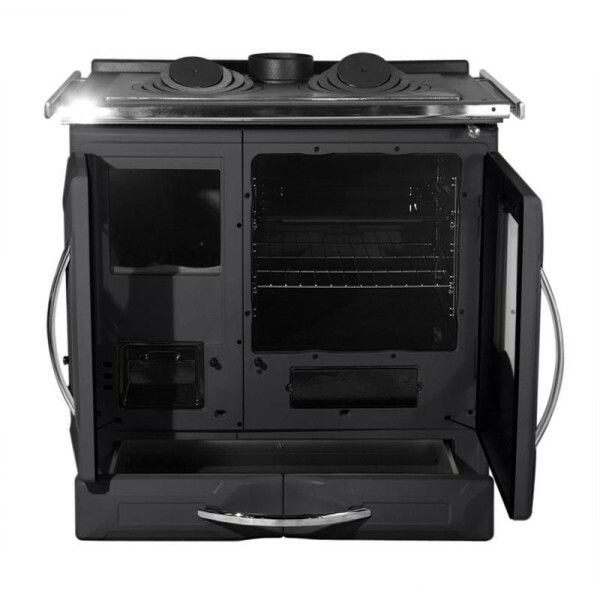 Not only will it provide heat to the room and evenly cook food in the oven or on the hobs, it can also be plumbed into your domestic hot water system and is even DEFRA Approved (UK) for use in smoke control areas. Please note, we advise purchasing the relevant Pipe With Damper and Double Socket Adaptor for greater control over combustion and easy connections to standard flue pipes. The Suprema is a available in either anthracite black, tortora or matt cream. Top cover (cast iron) is an optional item + £227. The La Nordica-Extraflame Group is driven by the characteristic forces of Italy’s north-east: passion and hard work. Even in the field of “traditional” heating, innovation has always been a feature of La Nordica-Extraflame products. Thanks to this, the Group has acquired a significant share of the market over the last 20 years, and now sells its products in 20 countries around the world. LA NORDICA S.p.A. La Nordica is a leader in wood burning heating appliances, and boasts an excellent reputation for developing new solutions to today’s ever more specific and demanding requirements. La Nordica’s vast range, including classic, rustic and modern product families, attention to detail, and consistently excellent quality prove the validity of this reputation. La Nordica brings top quality materials, accurate finish and attention to detail – in short, the best of aspects of Italian design – to customers all over the world. Continual and all-round training and professional development in the latest technologies and systems ensures that our customer service staff, installers and sales personnel always have the right answer. Because even our resellers need to share our sense of culture and progress, and share too the same approach to domestic heating, based on ecology, economy, reliable eco-compatible products, and a real commitment to lowering emissions. EXTRAFLAME S.p.A. After some 20 years of manufacturing electric heating appliances, Extraflame switched to designing, developing and producing pellet stoves. Extraflame’s innovative, functional, economical, ecological, and environmentally friendly products have firmly established the company as one of today’s market leaders. Extraflame has recently set up a new division dedicated to the development of thermal solar panel technology, and has developed a new, optimised system for independent central heating and hot water production that represents a valid alternative to conventional gas or fuel oil systems. 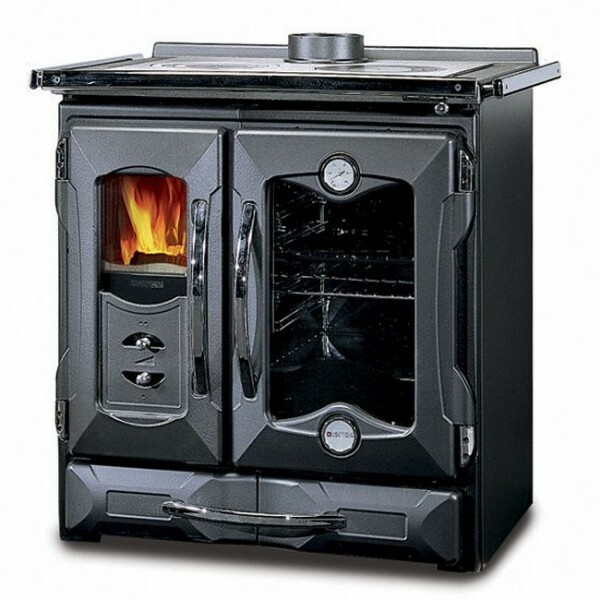 Buy now your La Nordica Cooker Stove Suprema Nero BLACK!